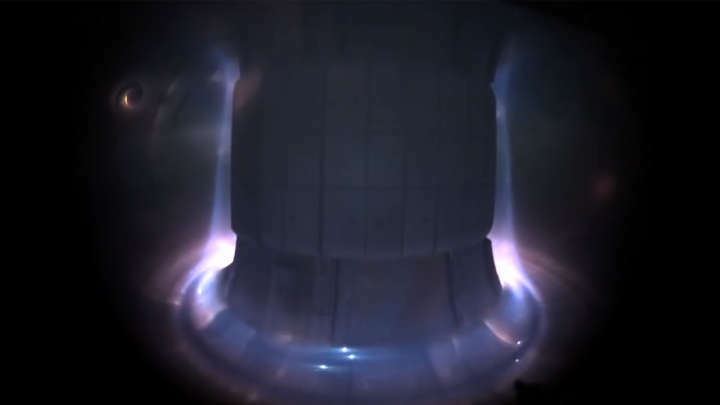 This immensely high-speed footage was released captured inside the Compass Tokamak at Institute of Plasma Physics IPP. It's a pretty beautiful sight, and it shows exactly what happens inside these huge devices. It all takes place in under two seconds – but, shot at a staggering 1,000-20,000 frames per second, the footage lasts about a minute long. Then, it comes to a dramatic conclusion in a burst of light, followed suddenly by darkness. ‘On 20th January, 2016, the first high-speed colour videos from the COMPASS tokamak discharges were recorded by a new fast CMOS camera of the Photron Mini UX100 type,’ according to the Institute of Plasma Physics IPP.